What is that clunking noise coming from the front of my car? What is that clunking noise coming from the front of my car? Why do I have problems when turning? Why is my car setting unevenly? 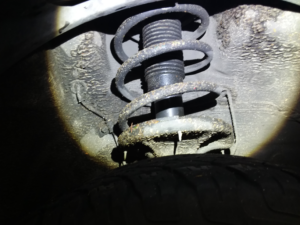 A broken coil spring can cause all these issues. Your coil spring and your shock or strut work in connection with each other to keep your vehicle stable. A broken coil spring will compromise the ride of the vehicle, the height the vehicle sits at, the way the vehicle handles turns or cornering, and the overall comfort of the ride. A broken coil spring can be a safety issue. If taking corners too fast, the vehicle may not react in the same way the driver is used to plus if the broken spring comes in contact with the tire it can cause the tire to blow out. If you are having any concerns about your suspension, call us today to schedule an appointment for a complete inspection so that we can assess the health of your vehicle. We want your vehicle to be as safe as possible, so that you can have some peace of mind.